Delicious and filling side thats still a lot lighter then mash potatoes and gravy for your next Thanksgiving dinner! (You will need a food processor for the sauce portion of this dish). 1To begin prep: chop, dice and halve your herbs, potatoes and brussel sprouts. Set aside and begin prep for quinoa. 2Combine 1 cup (rinsed!) uncooked red quinoa with 2 cups water in a medium saucepan or pot ( rule of thumb: should always be 1 part quinoa 2 parts water). Bring to a boil. Cover, reduce heat to low, and simmer until quinoa is tender, about 15 minutes. When ready, set aside and let cool. 3To begin the sauce, dice onion and place in hot cast iron skillet with 2 Tbsp of evoo on lowest heat. Once onion is soft and golden dash with cava vinegar and let reduce. Onion should cook for a total of 30 mins. Take off heat and let cool. Then add to food processor with additional sauce ingredients and pulse until you form a smooth paste. 4Set your oven to 375 degrees and let preheat. Place your sweet potatoes in a bowl and lightly drizzle with extra virgin olive oil, add rosemary, cracked sea salt and pepper to taste. Once evenly coated place on parchment lined baking sheet and cook in oven for 25-30 mins. 5While potatoes cook, place brussel sprouts in hot cast iron skillet and lightly drizzle with olive oil. Once brighter green, add honey and cook for 10-12 mins (or until just cooked through). 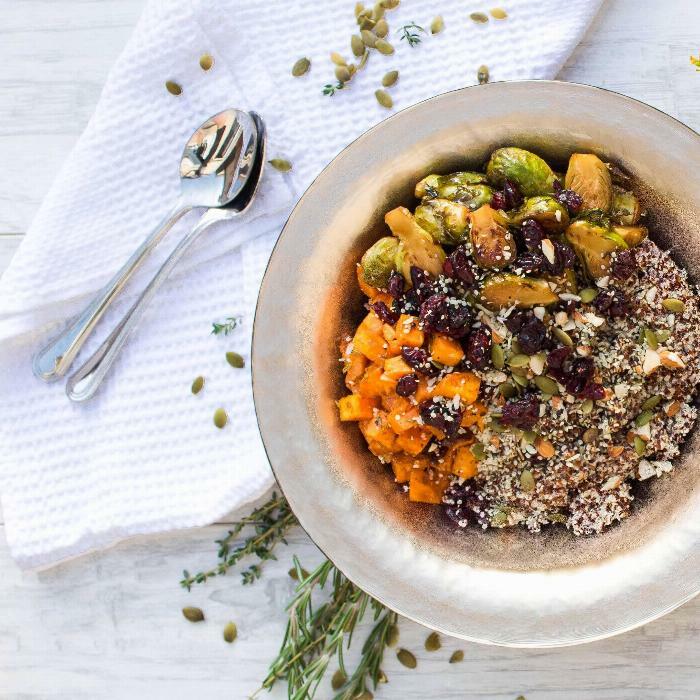 6Combine all dish components with quinoa in a large serving bowl and sprinkle with hemp hearts, slivered almonds, cranberries and pumpkin seeds. Goat cheese would make an excellent addition to this dish - but for a lighter and leaner taste keep as is.